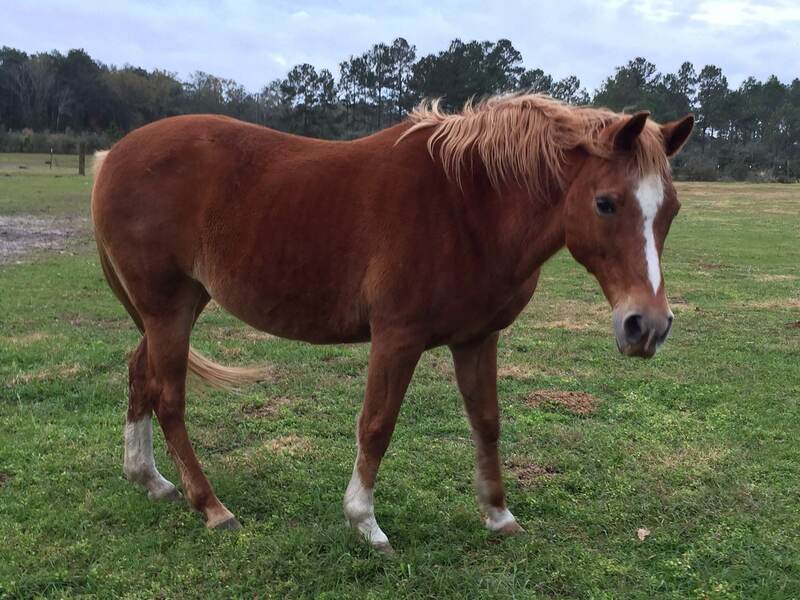 Shellie is a 25 year old, sorrel Quarab mare. She is a cross between an Arabian and Quarterhorse. Shellie competed up until the age of 16 as a multi-event horse (dressage, hunter jumper, western pleasure and speed) and belonged to a family in south Florida. She was purchased for my niece, Anni, as a trail horse and taken to North Carolina. Due to a family move, we were offered the chance to keep Shellie and provide her with a forever home and we added her to our family here in Florida. She is the only one of our active group that is trained in the English discipline. She is an excellent beach horse and takes her job seriously. She is one of the veteran horses who usually gets the younger kids or doubles and her best buddy is Little Bit. Her official position in the group is “Queen Bee” as everything is “always about Shellie”.